Bridges are inherently picturesque, and covered bridges even more so. The engineering and craftsmanship required to suspend materials over rivers, streams, and gorges is often remarkable to behold. This seems to be doubly true when it comes to covered bridges. 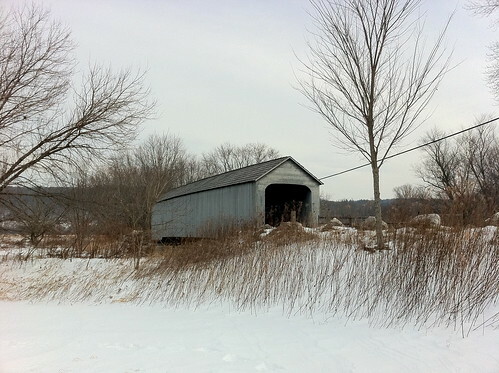 Idyllic winter scene: the covered bridge in Sheffield, Massachusetts. Humans have constructed bridges – and covered them – for thousands of years. As bridge engineering and materials have changed, the need to take the time and expense to cover bridges has been reduced. Most of the old covered bridges that were used in the United States have long since been replaced with modern, uncovered varieties. The result is that there are now fewer than 800 covered bridges in the country, where once they numbered in the tens of thousands. It’s worth taking a little side trip to see a covered bridge, if you happen to be anywhere near one. As it happens, our Berkshires Bed and Breakfast is near a covered bridge – the Upper Sheffield Bridge over the Housatonic River. It’s about fifteen miles south of our Lee Massachusetts Bed and Breakfast. Vehicular traffic is not permitted on the bridge, but visitors are allowed to walk across it. It’s fun to stand in the middle of the bridge on rainy days, safely dry as you listen to the river under your feet and the rain above your head. It’s also quite an experience to walk across the bridge on wintery days, when the shelter is both needed and appreciated. Covered bridges are part art, part architecture, and part historical artifact. If any of these areas interest you, check out the Upper Sheffield Bridge when next you stay at our Bed and Breakfast in the Massachusetts Berkshires. Please see Sheffield Covered Bridge for directions.